Miyagi Prefectur (宮城県, Miyagi-ken) is a prefectur o Japan locatit in the Tōhoku Region on Honshu island. The caipital is Sendai. 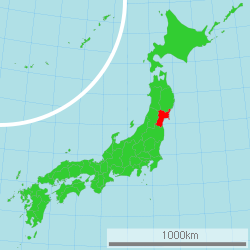 Miyagi Prefecture wis umwhile pairt o the province o Mutsu. Mutsu Province, on northren Honshu, wis ane o the last provinces tae be formed as land wis taken fre the indigenous Ainu an became the lairgest as it expandit northward. The auncient caipital wis in modren Miyagi Prefecture. In the third month o seicont year o the Wadō era (709), there wis an uprisin against govrenmental authority in Mutsu Province an in nearbi Echigo Province. Troops wur promptly dispatched tae subdue the revolt. In Wadō 5 (712), the land o Mutsu Province wis admeenistratively separatit frae the Dewa Province. Empress Gemmei's Daijō-kan continued tae organize ither cadastral chynges in the provincial map o the Nara period, as in the follaein year when Mimasaka Province wis dividit frae Bizen Province; Hyūga Province wis sundered frae Osumi Province; an Tamba Province wis severed frae Tango Province. Durin the Sengoku period various clans ruled different pairts o the province. The Uesugi clan haed a castle toun at Wakamatsu in the sooth, the Nambu clan at Morioka in the north, an Date Masamune, a close ally o the Tokugawa, established Sendai, which is nou the lairgest toun o the Tōhoku region. 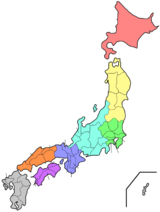 In the Meiji period, fower new provinces wur creatit frae pairts o Mutsu: Rikuchū, Rikuzen, Iwaki, an Iwashiro. The aurie that is nou Aomori Prefectur continued tae be pairt o Mutsu till the Abolition o the han seestem an the naition-wide conversion tae the prefectural structur o modren Japan. Date Masamune built a castle at Sendai as his seat tae rule Mutsu. In 1871, Sendai Prefecture wis formed. It wis renamed Miyagi prefecture the follaein year. On 11 Mairch 2011, an 8.9 yirdquauk an a subsequent major tsunami hit Miyagi Prefecture, causin major damage tae the aurie. Miyagi Prefecture is locatit in the central pairt o Tōhoku, facin the Paceefic Ocean, an contains Tōhoku's lairgest ceety, Sendai. There are heich muntains on the wast an alang the northeast coast, but the central plain aroond Sendai is fairly lairge. Matsushima is kent as ane o the three maist scenic views o Japan, wi a bay full o 260 sma islands covered in pine groves. Oshika Peninsula projects frae the northren coastline o the prefecture. ‡ Scheduled tae be dissolved follaein mergers. Although Miyagi haes a guid deal o fishin an agricultur, producin a great deal o rice an livestock, it is dominatit bi the manufacturin industries aroond Sendai, particularly electronics, appliances, an fuid processin. The sports teams leetit belaw are based in Miyagi Prefecture. Sendai wis the castle toun o the daimyo Date Masamune. The remains o Sendai Castle staund on a hill abuin the ceety. Miyagi Prefecture boasts ane o Japan's three greatest sichts. Matsushima, the pine-clad islands, dot the waters aff the coast o the prefecture. ↑ 1.0 1.1 Titsingh, Isaac. (1834). Annales des empereurs du japon, p. 64. Wikimedia Commons haes media relatit tae Miyagi prefecture.